Hello again! I figured I would share with everyone how I started or found THM. In 2017, around the holidays, I was feeling the pain of counting points. I saw a post on a board about Trim Healthy Mama. I started to explore Trim Healthy Mama. I explored youtube videos and blog posts. I went to the library and checked out the Plan book. I spent my nights listening to the poddies while I pumped for my baby and another baby in need of milk. I made a mistake when I made this. December 2018 is the top pic. 60+ lost in a year on THM! I spent a few weeks reading it, joined the FB groups and ordered the Trim Healthy Table book on sale from amazon. I spent a few weeks tweaking my current meals. I used to hit 'follow' on all the beginner THM posts. Then Christmas came. I ate 3 lbs of bacon and way too much dessert. I tried to stay on WW plan but I struggled. The next day, I did what THM calls a deep S meal for breakfast. When I planned my food that week, I chose an entire THM menu by accident. By the end of that week, I lost ten pounds after Christmas! I was struggling with counting points. I always struggle after a few months on Weight Watchers. It's not because WW doesn't work. I start hyperfocusing on the health of my eating habits and so much more. Other times I have done WW, I hyperfocused so much that I think I was practically starving myself by trying to go ultra point every meal. It made me struggle once I hit my lowest weight ever. It's one of those things where I felt like something was missing from my eating habits. Why is fat so vilified? That is what I love about THM. It's a balance of low fat and high fat. It's completely changed how I think about food. It's a strong balance of keto and WW type of low fat eating. I love this balance. I love how THM does not vilify going off plan. More women need to be told to restart in 3 hours versus a shame spiral. Also, that first week of losing ten pounds made me think, "Wow, this isn't so bad." THM can be attuned to everyone. Everyone will do THM different based on their needs. I am all about whole foods and nurturing foods. Another thing that was the reason why I was exploring THM is because we were planning to start trying to conceive. I know people follow WW while pregnant but like I mentioned, I hyperfocus to a bad point. 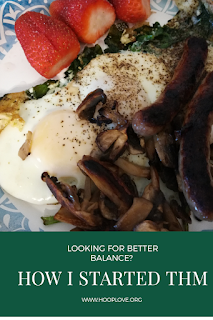 I felt like I couldn't/wouldn't find that proper balance while pregnant. It is so hard! THM is safe for pregnant and nursing moms. That sold me completely. I continued to follow THM. I would say most weeks I was 90% on plan. I did have a few weeks/months where I struggled with stalls. My milk supply did go down when I switched to THM. Mainly I should have added more XO and S-helpers. The first six months of THM, I struggled with low blood sugars. It finally hit me, this is the same feeling I always get postpartum after going home from the hospital. Almost every time, my discharges have taken way too long. By the time I would get home, my sugar was always low and I would have headaches/feel dizzy. This will be great info for me to know the next time I give birth! Knowledge is power! I did stall because of a prolactin issue. I had to stop pumping for babies in need of breastmilk and I am pretty sure I was just exhausted. It also coincided with my preschooler started school. Early mornings were rough for me if I was up till 1 pumping. By the way, poddies are perfect things to listen to while pumping at night! Stopping the pumping, helped my prolactin decrease which busted that stall. I have learned over the year of being on Trim Healthy Mama that your needs may change throughout your journey. I also found out that I do need to track my foods better. I can freestyle on THM for a few months but I need to track and manage portion sizes for a few weeks every few months. Basically when the scale stops moving so much, I still use iTrackBites to track my portions. I switched to calories recently for my mental health. Although I could do full nursing points and smart bites with success. Part time nursing was a bit of a struggle. I am not a perfect Trim Healthy Mama. I use some splenda when I bake at times. I go off plan on occasion. I try to have offplan treats on occasion like a non-fat milk coffee from a fancy coffee shop. Sometimes I even enjoy this H2Oprotein thing that is not on plan but close enough for me. I even will occasionally bite the bad bread or rice at Logan's! I don't guilt myself. I get back on track as soon as I can. I enjoy how I eat and am able to eat out with my mom once a week. Yes, I still lose weight! Feel free to check out my blog post on my THM beginner tips: Click me! If you want to see a video on THM beginner basics, click me! and Video tips! 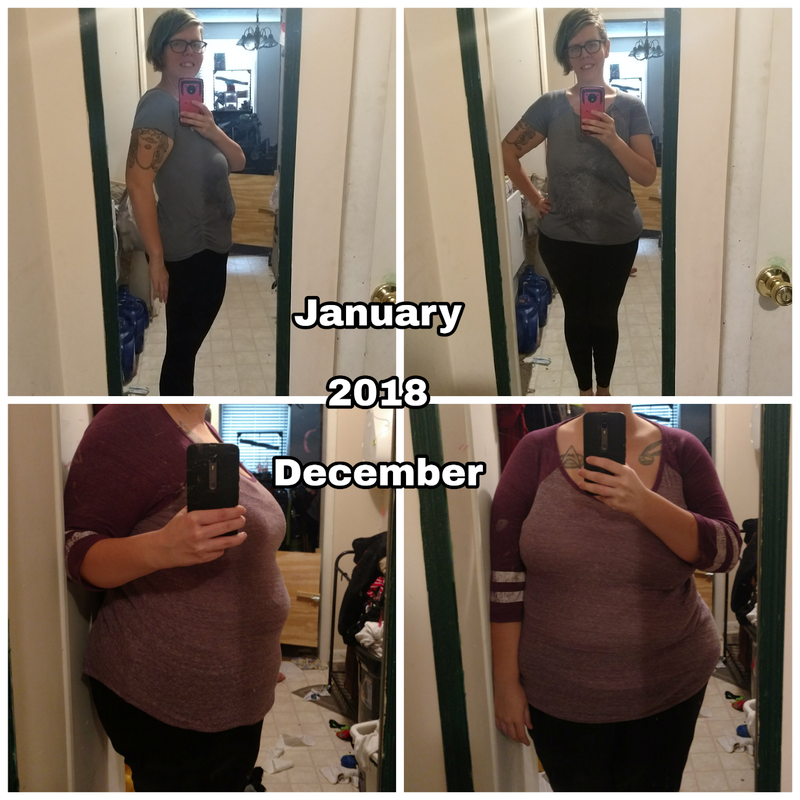 As of December, I have lost 118 pounds total. Over 60 pounds with Trim Healthy Mama. My goals one day are to become a THM coach or any sort of wellness couch. My weight loss is at a standstill currently because December 4th, we are expecting our first little girl. I will give you further updates how a Trim Healthy pregnancy is treating me. In December-January, I tried to do the Bikini Body Mommy program and quit it quick. After that, I waited till March to add workouts. I added barre-type DVDs into my exercise program. I have a fluidity barre at home and wanted to get my money worth. Once the weather was good, I would take the kids on a one mile stroller walk on the only "walkable" area in my neighborhood. Around the start of summer, I was able to go to classes at the local barre studio, The Barre. Unfortunately, my time at the barre has come and gone. Now, I am using barre DVDs at home, SBF streaming, and prenatal workouts on youtube. You don't need a gym to get fit though! There are so many free and streaming options available to you. Click these affiliate links to help out my channel and my family!